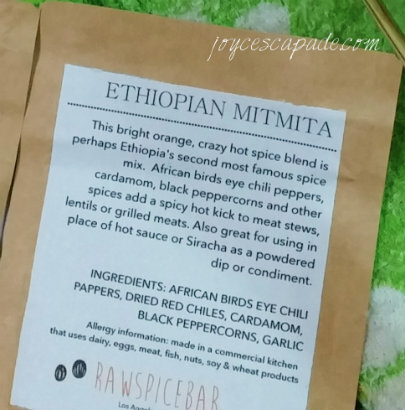 Thanks RawSpiceBar for sending me the November 2015 Spice Box. I have used the box's Pumpkin Pie Spice to make my cuppa Pumpkin Pie Spiced Coffee and to bake Crunchy Roasted Chickpeas. 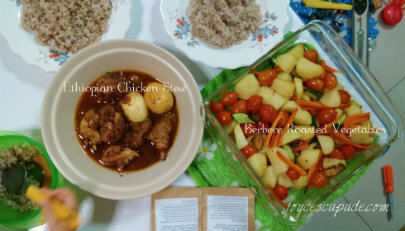 Now I cooked Ethiopian Chicken Stew and Berbere Roasted Vegetables. The spices I used are Berbere and Mitmita. 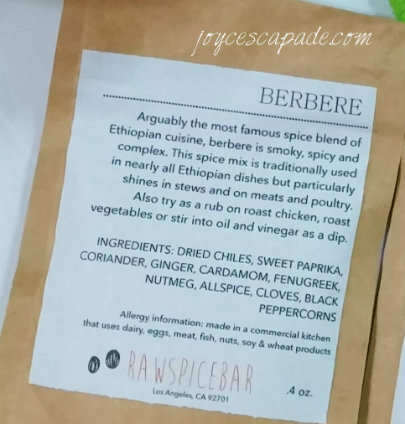 Arguably the most famous spice blend of Ethiopian cuisine, berbere is smoky, spicy and complex. This spice mix is traditionally used in nearly all Ethiopian dishes but particularly shines in stews and on meats and poultry. Also try as a rub on roast chicken, roast vegetables or stir into oil and vinegar as a dip. This bright orange, crazy hot spice blend is perhaps Ethiopia's second most famous spice mix. African birds eye chili peppers, cardamom, black peppercorns and other spices add a spicy hot kick to meat stews, lentils or grilled meats. Also great for using in place of hot sauce or Siracha as a powdered dip or condiment. Heat up vegetable oil in frying pan over medium-high heat. Add onions and cook, stirring, until golden brown, about 10-15 minutes. Add garlic and cook, stirring, for 2 minutes, until fragrant. 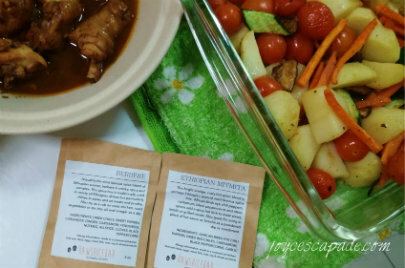 Add RawSpiceBar's Berbere & Mitmita spices and molasses sugar, cook, stirring continuously, for 1-2 minutes, until fragrant. Add chicken chunks and chicken stock. Bring it to a boil. Reduce heat to medium-low. Simmer the chicken for at least 55 minutes. Add in the hard-boiled eggs and simmer for another 5-10 minutes. Add salt and pepper to taste. Serve with steamed mixed grains rice. Preheat oven to 200ºC. Parboil the potatoes in boiling salted water for 5 minutes. Drain. Toss potatoes, carrots, and cherry tomatoes with RawSpiceBar's Berbere, salt, pepper, and olive oil until well coated. Place on foil-lined roasting pan and roast for 20 minutes. Turn the vegetables around and roast for an additional 10 minutes, or until fork-tender. Remove from oven and serve. Connect with me on my Facebook page and Instagram for more updates! Never heard of such spices. Your stew looked good. 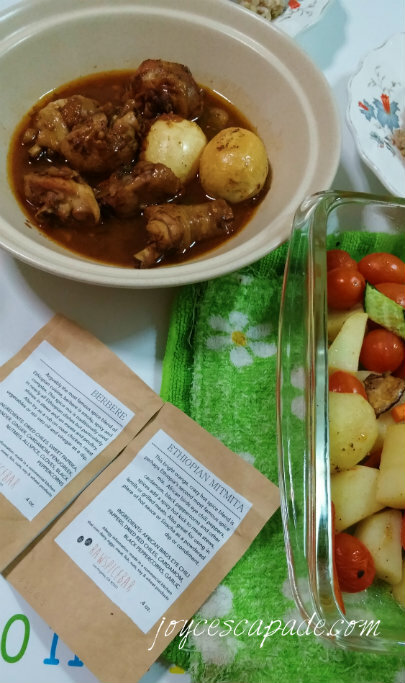 Very interesting blend of spices for the dish of Ethiopian Chicken Stew .. looks good and I bet it tastes great too. The roasted vegetables just as tempting. Enjoy ^-^!